Engaging and involving drama that tells a fascinating true story, thanks to a sharply observed script, impeccable production design work, assured direction and superb performances from Daniel Radcliffe and Dane DeHaan. 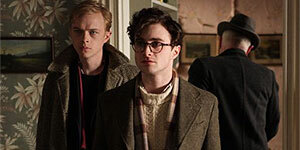 Directed by John Krokidas (making his debut), Kill Your Darlings is set in 1944 New York and stars Daniel Radcliffe as pre-fame Beat poet Allen Ginsberg, who attends Columbia University, encouraged by his poet father Louis (David Cross). Allen's life at college is transformed when he meets dangerously charismatic student Lucien Carr (Dane De Haan), who, in turn introduces him to fellow future Beats Jack Kerouac (Jack Huston) and William Burroughs (Ben Foster). As well as drawing him into experimenting with drink and drugs, Carr persuades Allen to perform anarchic, establishment-baiting pranks involving the texts in the school library and Allen finds himself falling in love with him. However, when Carr is accused of murdering his friend David Kammerer (Michael C Hall) – an older man, who's infatuated with Carr, to the point of writing all his coursework for him – Allen is placed in an uncomfortable position when he's forced to testify. Despite wearing a pair of extremely familiar glasses, Radcliffe does an excellent job of banishing memories of a certain boy wizard, nailing the American accent, generating genuine chemistry with De Haan and delivering what is easily his best post-Potter performance to date. De Haan is equally good as Carr, turning in a charismatic and complex turn that's extremely likeable but also allows you to sense the frightening hint of dangerous instability just beneath the surface. In addition, there's superb support from Ben Foster (whose wonderful recreation of William Burroughs's distinctive voice is worth the price of admission alone), Michael C Hall and Jack Huston, while Jennifer Jason Leigh is moving, though under-used as Ginsberg's mentally disturbed mother. In fact, all the female roles are pretty much side-lined - Elizabeth Olsen appears only briefly as Kerouac's girlfriend, as does Kyra Sedgwick as Carr's mother. The sharply observed script is excellent, telling a fascinating true story (Carr's importance and influence have been largely overlooked) and conveying a powerful atmosphere that carries the seeds of the writers the group of students are to become (one prank played by Burroughs foreshadows his working method for The Naked Lunch). Similarly, the production design work is impeccable, heightened by a suitably jazz-heavy score by Nico Muhly. Sharply written and superbly acted, Kill Your Darlings is an emotionally engaging and intriguingly dark drama that's something of a must-see for literature students. Recommended.